Orchestral, solo and chamber music composers of all eras have written prominent, beautiful, and often melodic, solos for the oboe and its bigger relative, the English horn. The English horn is a transposing instrument pitched in F. Other oboe family members include the oboe d’amore, which covers the range between the oboe and English horn and is a transposing instrument in A, and the bass oboe, which sounds an octave lower than written. Rarer instrument family members included the hecklephone, which sounds an octave lower than written like the bass oboe, and the small musette or piccolo oboe, which is usually in pitched in F. The metal Sarrusophone is hardly ever heard today. Good candidates for oboe players include those who would be comfortable taking on a leadership role and playing a less common instrument. Generally, there are only one to three oboists in any ensemble, and, in more advanced repertoire, each player has an independent part. Oboists should also possess the patience to work on finding and ultimately making good reeds and keeping their instrument in good shape, which usually means seeking repair help beyond the local music store. If you are in a position to start a beginning player, choose someone with average lip size. It is best if both lips are of a similar size, and the top lip in particular should not be small or short because it needs to be wrapped around the teeth. Long, narrow fingers are preferable, though not a requirement, and the ability to blow strongly is also important. The most important factor, however, is a student’s desire to play the oboe. Let students hear what an oboe can sound like and find out if the sound appeals to them. It is difficult to evaluate students’ lips merely by looking at them, so let the interested students try the oboe for a few weeks and see how it goes. After a few weeks of working, it will become apparent if there are insurmountable problems with the fingers or the embouchure. If a student with dental braces has trouble, it will likely resolve when the braces are removed. It is important for families to recognize the financial aspects of the oboe, as the instrument itself costs more than the flute, clarinet or saxophone to purchase. Oboe students often do best when they take some private lessons, particularly in the beginning of oboe study. The largest recurring cost to the oboe player is that of good oboe reeds. This cost could easily be ten times the amount paid for clarinet or saxophone reeds. Furthermore, oboe reeds wear out sooner than the thicker, larger single reeds, or thicker bassoon reeds, so they may last one third as long; less if the fragile tip is damaged. When a student learns to make reeds, the cost of playing oboe is reduced, but reed making is a skill that an oboe player cannot learn without the help of a private teacher and a significant amount of practice. Even when an oboist does learn to make reeds, he or she usually cannot make them to the level of handmade reeds purchased from professional oboists until beyond high school age, with the exception of an extremely dedicated student with an excellent teacher. The importance of a good reed in relation to both the ability to play with a tone that blends and the possibility of playing well in tune in the high register cannot be exaggerated. If you are planning to transfer a student from another woodwind instrument, keep in mind that former flute players will likely have trouble with the increased air pressure of the oboe. Clarinetists will probably need to work on having less upper lip pressure on the oboe reed, and saxophonists will need to practice keeping the oboe reed from sliding too far into their mouths. 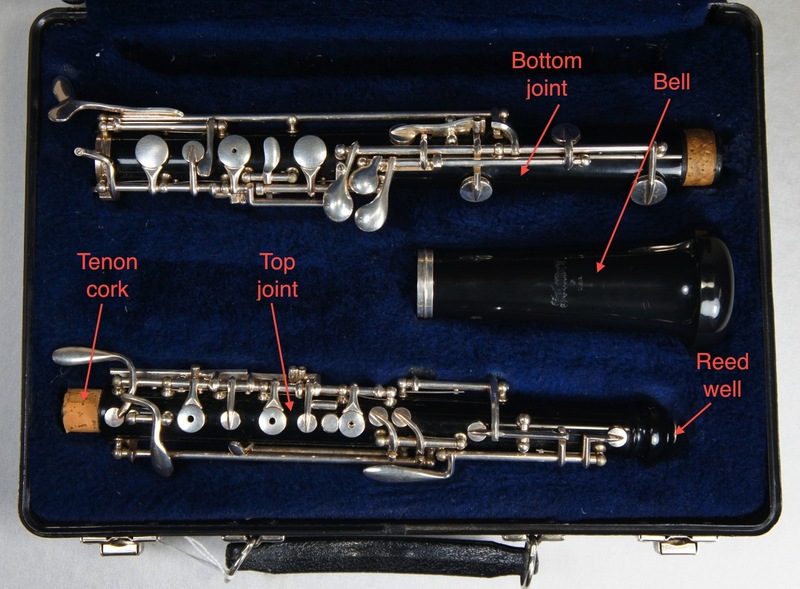 There are four parts to the oboe: the reed, the top joint, the bottom joint, and the bell. 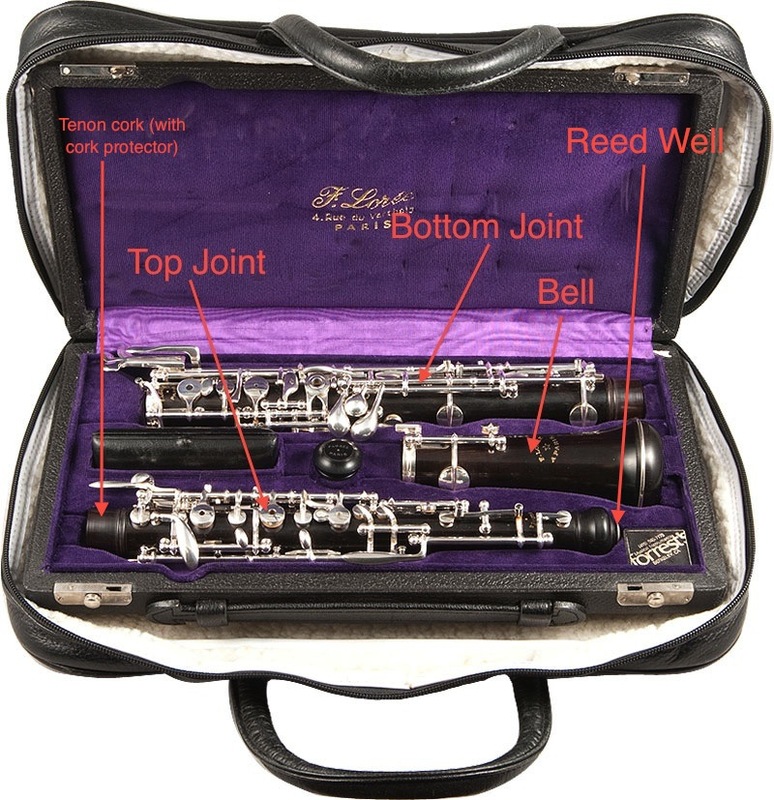 The reed is stored in a case, which is kept in the instrument case.